Maria Alm is a village in the Pinzgau area of Salzburg. It is one of Austria′s most popular and busiest skiing towns. 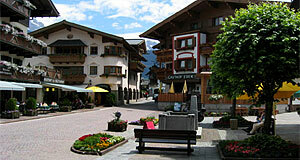 Maria Alm has a population of approximately 2,000 and is situated about 5 kilometres east of Saalfelden. This means that it is easily accessible from the capital Salzburg and its international airport. Together with Dienten and Mühlbach, Maria Alm forms the skiing region Hochkönigs Winterreich. This skiing region extends between altitudes of 860 and 1920 metres and offers a total of 150 kilometres of maintained slopes. A smaller skiing area in Hinterreit is not part of the Hochkönigs Winterreich and targets mainly families. It is now part of the enormous Ski Amade region. Historically, Maria Alm comprised of a few farms and was shaped by agriculture and forestry until well into the 20th century. Skiing tourism only developed in the 1960ies. Since then, the village character of Maria Alm was pretty much lost - it is now a modern and busy holiday town with two seasons: Skiing in the winter, hiking, mountain biking and other Alpine sports (or non-Alpine ones such as golf) during the summer. Maria Alm is somewhat exclusive, due to the accessibility from Salzburg. Many wealthy people purchased properties in or around the village, including the former German president Walter Scheel, the family that produced Mars chocolate bars and Formula-1 driver Keke Rosberg. The vicinity to the ultimate jet-set skiing town Kitzbühel as well as to Salzburg and the high number of golf courses in between these three places certainly helped to built up this aura of exclusivity. That being said, the skiing attracts "ordinary" tourists and locals as well. Maria Alm also makes a good base for exploring the Steinernes Meer during the summer season, a very challenging mountain range. For sightseeing, note the former hunting chateaux of Poschengut. It was built by Prince Archbishop Matthäus Lang von Wellenburg around 1545. It can be found in the Urslau are of Maria Alm and is private property.